Many homeowners purchase a beautiful Japanese maple in spring only to bring in burnt and damaged leaves in summer. The tree isn’t dying – it’s just suffering from heat stress. A common misconception is that Japanese maples can’t tolerate a full sun location. But this is not true. 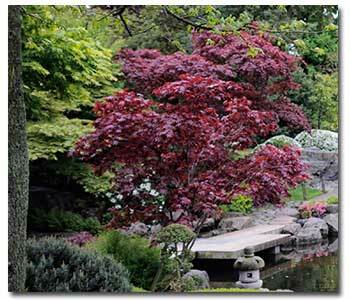 All Japanese maples can adapt to a full sun location and, in fact, tend to color up better when they are in one. What most people experience is summer heat stress due to infrequent (or lack of) water when the tree needs it, especially during a heat wave. Most Japanese maples will burn a little on the leaf tips in the first year while acclimating to a sunny location. But after that, they should not experience more stress. The reason maple leaves turn brown on the edges in summer is that the tree is unable to replenish the moisture the foliage loses through natural transpiration. As moisture leaves a plant, the tree draws moisture up from the ground to keep the cells in the leaves healthy and robust. If the tree has no moisture to draw from, the cells burst and die, which leads to the burning one sees on the leaf edges. This condition can also be caused by salt burn from the use or overuse of strong chemical fertilizers containing high amounts of nitrogen, especially ammoniacal nitrogen. Even if the soil is moist around the trees, the tree can burn because the moist soil actually activates the fertilizer and the tree cannot control the amount of fertilizer it draws up. What Japanese maples do need is a consistently moist, well-drained environment and, preferably, the use of an organic fertilizer. The term “well-drained” is key because regular watering in a poorly drained area will lead to root-rot and, ultimately, death. So never plant a Japanese maple in a low spot or next to a downspout or gutter. The amount of watering it takes to maintain a consistently moist condition will vary with soil type and location but on average Japanese maples should be checked for watering every 2-3 days.